You're either a brussels sprout lover, or your not. If you are, great ... we can be friends. If your not ... well .... maybe I can turn you into one. There is something I should tell you. I'm kinda famous for turning the most cynical brussels sprout person into a fan. Really. There is something else I should tell you. I use the term famous loosely. It all started when I decided to take a variation of the warm brussels sprout salad to a work pot luck. With all of the other people signing up to take things like chocolate cake and cheesy artichoke dip, it was risky to walk in there and throw down a giant dish of green vegetables. But I did it. The sprouts got a few dirty looks. But eventually people started trying them and .... liking them. Then they made other people try them. I gain some street cred. Some brussels sprout cred. 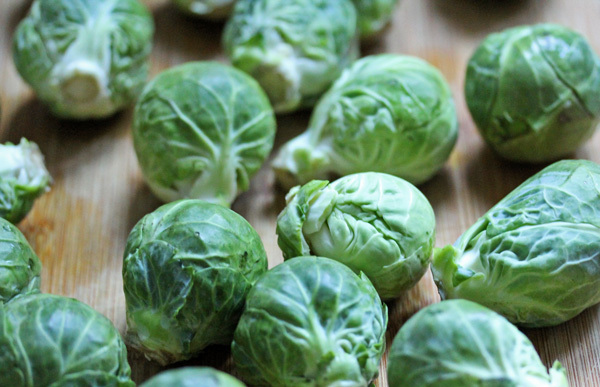 I even got a few brussels sprout haters to try them. One hater even told me that he loved them and would make them for himself. Maybe he was just being nice since I was standing right there. Maybe he was telling the truth. I like to think he was. Listen up. The point is, brussels sprouts are really good if you know what you're doing with them. There are about 1001 fabulous ways to make them and even more ingredients you can combine them with. This recipe here combines them with the sweet, rustic, Fall taste of apples which seems to be a natural compliment to the cabbage-like green. And the mustard. Don't get me started with the mustard. It is all totally meant to be. Start by pan roasting your brussels sprouts. In a large pan, heat 2 tablespoons of oil over medium heat and add the brussels sprouts. Cook the brussels sprouts, turning occasionally, until they begin to brown caramelize. They should be tender (you can test this with a fork). This should take about 25-30 minutes. 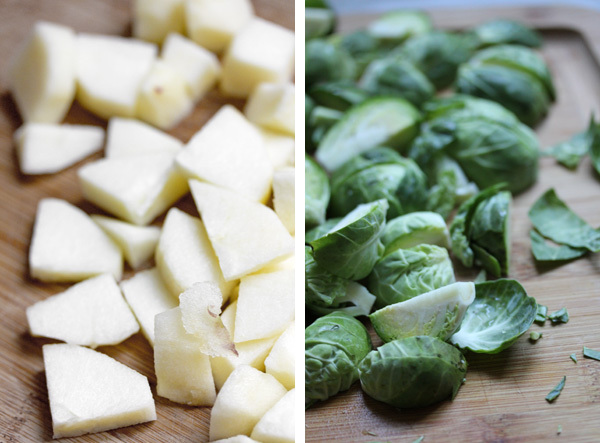 Once the brussels sprouts have been cooking for about 15 minutes, start cooking the apples. In a separate medium sized pan over medium heat, heat the remaining 2 tablespoons of oil and add the shallots and garlic. Cook them for 2-3 minutes until they become fragrant. Add the apples and stir to coat them with the shallots and garlic. Cook for 7-10 minutes, stirring occasionally, until the apples start to brown. 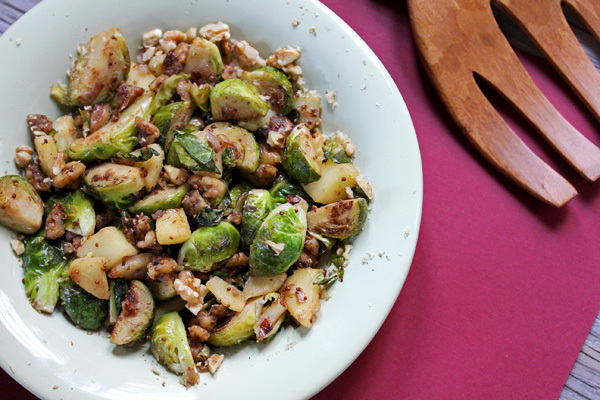 While your apples and brussels sprouts are browning, make the dressing. In a small bowl whisk together the two mustards and the vinegar. Add your apple mixture to the pan with the brussels sprouts. Turn the heat down to low and stir to combine everything. Add the walnuts, and give it another good stir. After 2-3 minutes add the dressing and stir some until it is evenly coated.